This is my second purchase from LexArtGlass, and once again I would like to give Leo ten stars instead of five. 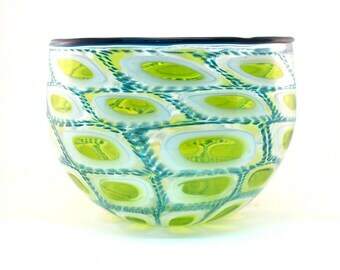 Not only is the bowl beautiful, but in addition, Leo is a charming seller who ships immediately and responds promptly and cheerfully to all communications (much better than I do, I might add :). I've made many online purchases from artists over the years, but Leo tops them all! Artists add beauty and enrichment to our lives and some artists are better than others. We only get to see extraordinary artists in museums. Even the really good artistic pieces are priced beyond most budgets. Leo is an exception. Leo is better than “really good” and his pieces are reasonably priced. It seems that Leo blows glass mostly for the love of making pieces and not for the necessity of selling his works. No mass production here – each piece is unique. Leo also develops. He continues to explore different ideas. His current works differ from his earlier works. My last purchase – a deep red “wave” platter – had an “oh so subtle” white foam edge coming off a “wine-dark” sea. Leo makes really good stuff. Too bad I cannot give him a 10-star rating. This item is exactly what I was hoping to find - a perfect Christmas gift for my parents. Leo went above and beyond to help make sure it all worked out - including an extra trip to his studio and quick shipping to ensure it arrived in time. The colors in the glass are beautiful and pop in the late after Charleston sun. Thank you Leo! I can't wait to collect more pieces for myself and as gifts for loved ones. I grew up in a small cattle town in the middle of South Dakota. My mother was a musician and pianist, and my father was a carpenter. They had taken a 19 year break from having children when I came along and added a third son to their previous two. I grew up on Main Street. I took lessons in ballet and tap for 10 years, and studied piano under the guidance of my grandmother. I worked hard in school and then, like so many others from that part of the country, I left. I now live in Washington, DC, and I blow glass at DC Glassworks, a public access studio in Prince George's County, Maryland. I've always had an appreciation for the visual and performing arts, although my own ventures in visual arts began much later in life. I remember being amazed watching a college roommate (an art student) draw a self-portrait in dots as he sat in the doorway of our dorm room. (He also maintained an assembly of vegetables in a still-life well past its prime until I threw it out.) A close friend of mine is a set designer. And of course, I hold dear the memory of my father's work as a cabinet maker. I identify more closely with glassblowing as a craft than as a medium for conceptual art or other forms of sculpture, although I recognize and appreciate its use in those ways. I make objects that can be used in everyday life. At the same time, I try to bring a bit of levity or color to platters, bowls or vases--in the same way that my father would taper the legs of a buffet or bevel the edges of a cabinet, giving them a distinctly mid-century design. (He learned his craft in the mid-1940s with assistance from the GI Bill). I enjoy the process of glassblowing more than the successful completion of an object. When I work with fluid glass to give it form, add color in a new way, or practice a new technique, I focus on the moment and other concerns slough away. The heat of the studio puts me in a different state of mind. A state of openness, and if I'm lucky, a state of inspiration and creation. I grew up in a small cattle town in the middle of South Dakota, but I've lived in the nation's capital for nearly 20 years. 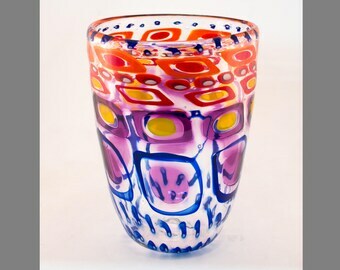 I blow glass to challenge myself creatively, and I make (often colorful) vessels that may be both displayed and used. Each item of Leo Lex Glass (LexArt Glass) is handmade. My goal with each piece is to create an item that is balanced and beautiful. Because of the nature of the craft, each piece is likely to have small imperfections or markings that distinguish it: bubbles, faint ridges left by tools during shaping, and almost always a punty mark on the bottom. Most of the colors that I work with are transparent. To really enjoy the beauty of those colors and the luminescence of the glass, plan to display them in well-lighted areas. The photographs shown in the shop were taken using white backgrounds and good lighting to emphasize the color of the glass at its best. I want you to be happy with your purchase. If you are not, please convo me, and I will work with you to arrange for a return and a refund of the purchase price. Shipping costs generally remain the responsibility of the buyer and are not refundable. I accept credit cards, debit cards, Etsy gift cards, and Paypal. Once payment is received, I will ship the item well-packaged, using either the US Postal Service or FedEx with delivery tracking. If you have a preference for one over the other, let me know, and I will try to accommodate your request given the shipping amount noted with the item. Insurance is available for an additional fee. Items are generally shipped within 1 to 2 days after payment is received. If you are requesting delivery outside of the U.S., please convo me before purchasing, so that we can work out details for shipping. Please make sure that the shipping address you enter during the Etsy checkout matches the shipping address used by PayPal. If it does not, I will contact you to clarify the shipping locale, and shipping may be delayed.